If you’re looking to really hone your photography skills, a DSLR camera is the way to go: they’re the choice for serious photographers, as their interchangeable lenses and full controls give you the freedom to play with features such as the focus, aperture, shutter speed and ISO, providing you with all the free reign you need to create truly inspiring images. 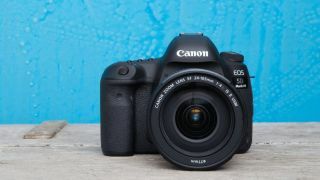 Our round up will help you navigate the features and specifications to look out for to help you find the best DSLR camera for you. Unfortunately, price is always a good indication of how good a DSLR camera is. Experienced amateurs and those looking to go professional need to look at something like the Canon EOS 5D Mk IV. At £3,249.00, it’s not the most expensive camera on the list but it packs a whole bunch of desirable features, including a full frame CMOS sensor and a fantastic ISO 600-32,000 sensitivity range. Novices, don’t fear, as the Nikon D3300 Digital SLR Camera is perfect for you guys. It’ll set you back around a respectable £299.99 and although there’s a compromise on the sensor size, for beginner photographers, it’s still perfectly good enough to capture awesome images. If you’re looking for a fantastically priced professional camera, this DSLR camera is certainly worth considering. Featuring a 30.4 megapixel resolution, a wide ISO range for capturing quality images in the dingiest light conditions plus a DIGIC 6+ image processor, this camera boasts all the tech you need to take incredible photographs. It’s not just about the stills, either. With the ability to shoot 4K videos, whether you’re a wedding specialist or love a scenery shot, this camera will certainly serve you well. With its helpful Guide Mode, this Nikon is the perfect DSLR camera for beginners. It features a respectable 24.2 megapixel sensor and an ISO range of 100-12,800 which means you’ll be able to capture awesome images in a whole range of light conditions. It allows budding photographers to really experiment too, with 13 different image effects to touch up your images and your videos, while the 11 point focus system, while not quite the 61 of the Canon, still allows you to capture great images on the move. We would be here all day if we listed all the impressive things that are going on with this camera but to give you just a flavour, here’s a couple of our favourite features. An impressive 45.4 megapixel sensor with the potential to shoot 8K time lapse, a massive Expeed processor to capture every minute detail, a huge ISO of 102,400 to capture the clearest night shots and an incredible 153 point automatic focus system to snap the stills of the quickest moving objects. If you’re willing to splash the cash, this Nikon is hard to beat. The Pentax K-1 is a really exciting camera and coming in with a price of just under £1600, is probably one of the best full frame sensor cameras you can get for the price bracket. Whether you’re camping at night or capturing stills of your family racing down the mountain side, with its -10 cold resistant construction, incredible ISO 204800 and decent 33 Auto Focus points, the coldest, darkest and speediest conditions are catered for. Astrologists will love its Astrotracer technology, while the Pixel Shift Resolution System should ensure all photos are produced with amazing clarity. While it may not have the full frame sensor of its more expensive counterpart, paired with the impressive EXPEED 5 image processor, the Nikon D500 is still a very good camera. It’s megapixels are slightly less than others on the list, but in return you get the massive 153 Auto Focus points that its big brother boasts, meaning you’ll be able to capture awesome images on the move. In addition to the above, the camera shoots video in 4K Ultra HD detail, making this a fantastic all rounder perfect for amateur photographers. Yes, it may only have a 12.2MP megapixel camera but take no notice of that, especially if you love filming and shooting on the move. It’s most impressive feature is probably its incredible 169 Auto Focus, while the combination of a BIONZ X image processor, 5-axis Image Stabilisation ability and awesome ISO of up to 409,600 make it an incredible camera for filming in all lighting conditions. Heading away on holiday soon? Consider taking a compact camera.